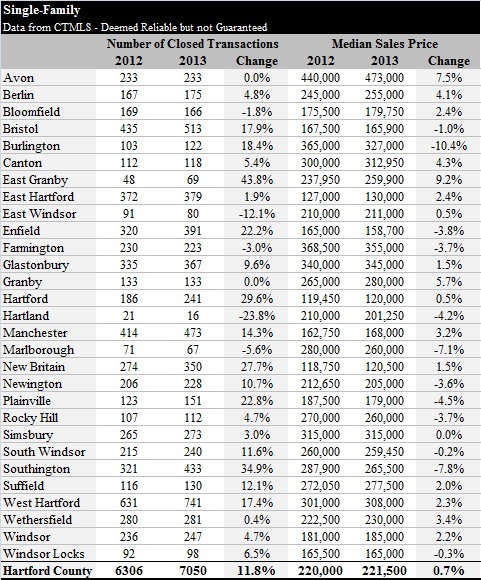 West Hartford finished August 2013 with 84 single-family closings, up from 76 in August of 2012. 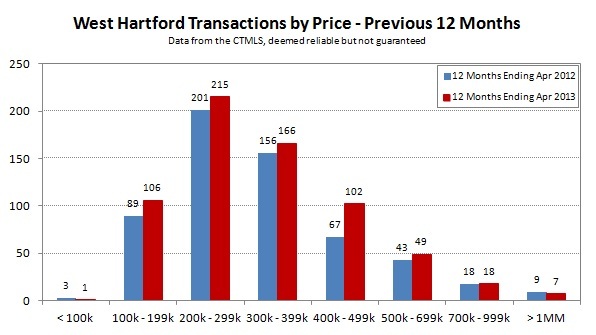 Overall the town is about 12% ahead of 2012 in terms of transactions. The most active price bands are showing an increase in activity over the past 12 months. Homes priced at the upper end of the market are in line with the previous year. However, at the lower end of the market there has been a 13% decrease in the number of deals that have closed in the $100,000 through $199,999 range. We believe this is a signal of strength in the market. 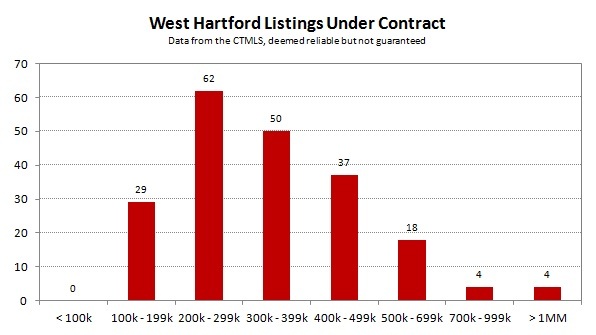 There is enough demand for West Hartford homes that properties that would have previously sold for less than $200,000 are now commanding slightly more than that (arbitrary) threshold. Another stat that points to high demand for homes in the $100,000s is the ratio of properties under contract to properties actively for sale. That price band is the only one in which the pending deals outnumber the active listings – and it’s not even close. The big question as we move into the fall is whether the market will drop off sharply, like it did in 2012, or whether it will gradually decline as we approach year end. 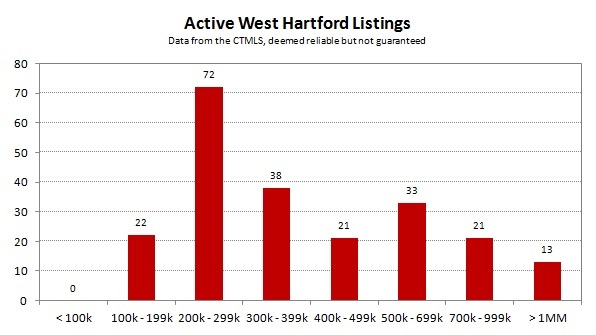 West Hartford has been one of the hottest real estate markets so far this year. Here are a few charts to show where it is as of the middle of the spring season. 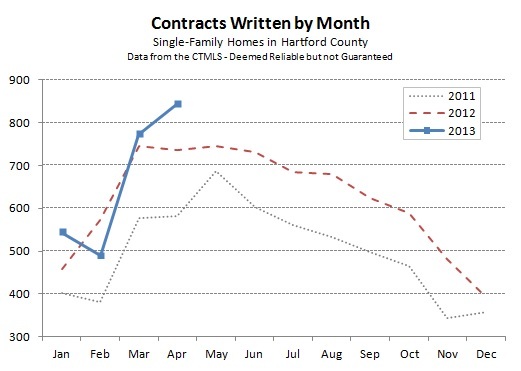 Data is for single-family homes and comes from the CTMLS, which deemed reliable but not guaranteed. The number of closed sales has at least equaled the 2012 total in every month. Overall, 19% more deals have closed this year compared to the first four months of 2012. The number of closings over the past 12 months has increased in nearly every price band. The jump in the $400,000s has been especially impressive. Demand for homes, as reflected in the properties currently under contract and waiting to close, is well distributed by price band. Supply of homes is limited, averaging about 3.5 months of inventory. At price points below $500,000 the market has even less available for buyers. 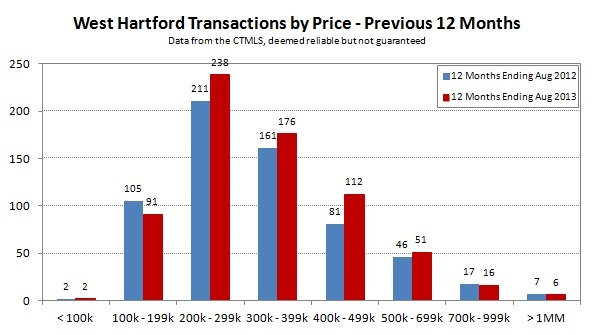 What these charts don’t show is that prices are increasing in West Hartford. Because every property is different, and the mix of homes that sell in a given period of time is constantly changing, there is no easy metric that captures pricing accurately. But any (active) real estate agent can tell you that bidding wars are back, and that buyers need to have their act together in order to have a shot at getting an updated home in the middle and lower price bands. 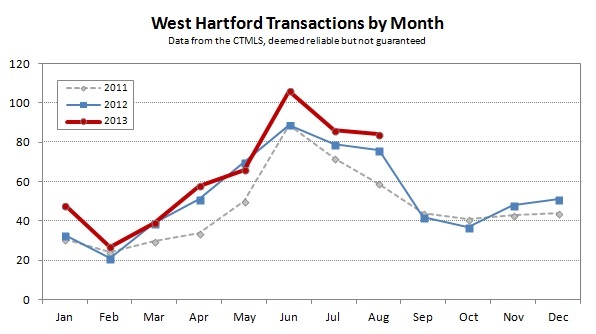 The Hartford County single-family housing market continued its strong spring. Overall, buyers and sellers agreed to 845 deals during the month, which is nearly 15% higher than April of 2012. The year-to-date number of contracts is more than 5% ahead of where it was at this point last year. Strong April performance helps support our view that the February result was an aberration. Both March and April finished with higher contract totals than any individual month since April 2010. Long time market observers will recall that the final Federal Home Buyer Tax Credit expired on April 30, 2010, so there was a huge push to get homes under contract that month, followed by the market flat-lining for the rest of the year. 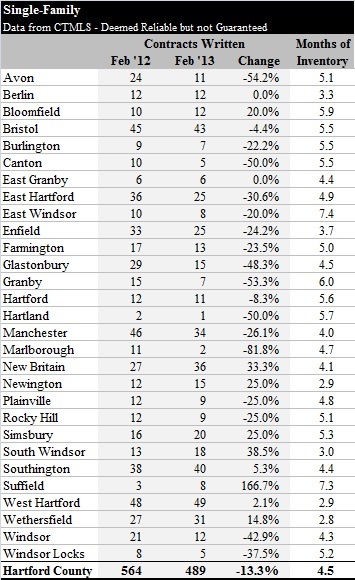 The town by town table shows that inventory levels increased despite all the homes that went under contract. This time of year is the peak activity level, with both new listings appearing and deals coming together at a rapid pace. There continue to be towns with relatively few houses available for buyers, and very quick sales with bidding wars are common. On the other hand, there are also towns with lots of vacant properties and opportunities for buyers to get aggressive. Here are the stats for the individual towns. February was dramatic and interesting; the market statistics brought something new and different to think about and interpret. 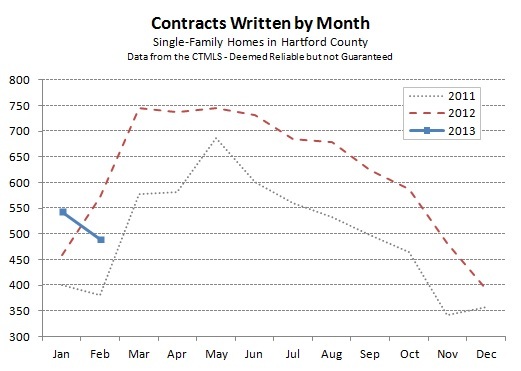 There were 489 Hartford County single-family contracts, a 13% decrease from February of 2012 and a 10% decrease from January of 2013. As the month progressed, we felt that the market had noticeably slowed from the January pace. But it’s very difficult to know how much of what we see is specific to our current set of clients versus happening throughout the County. Running the numbers seems to show that our experiences were representative of the overall market. Despite the step backwards in February, we continue to believe that the local real estate market is poised for a strong spring. The main reason February is unlikely to establish a new trend is that we were hit with a very significant snow storm near the beginning of the month. The storm shut down buyer activity for the good part of a week. The storm also seemed to encourage sellers to delay listing their homes. 857 new properties came on the market in January of this year, compared to 684 in February – a 20% decrease. As a point of comparison, there were 860 new listings in January 2012 followed by 904 more in February 2012. 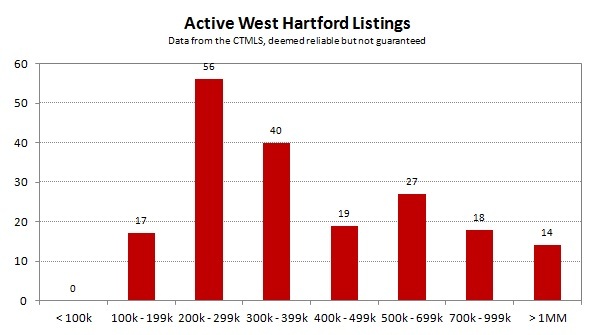 The slowing pace of listings shows up in the inventory numbers for the individual towns. 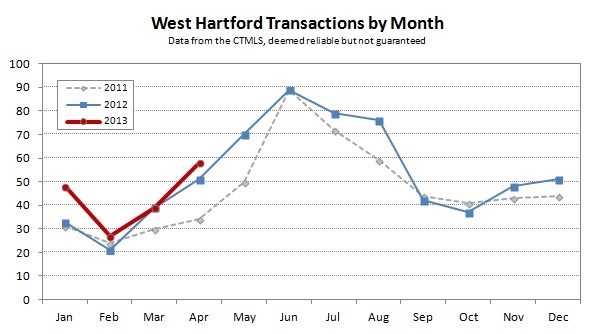 We now have four towns with 3 months of inventory or less: Wethersfield, West Hartford, Newington and South Windsor. Less than three months of inventory is generally considered a seller’s market. Listing activity began to increase this past Monday, as the automatic searches we have set up started picking up more new properties to send out to buyer clients. Spring will be good opportunity for sellers looking to move. Buyer activity and interest is up, and prices in many towns finally seem to be moving in the right direction. We’ve reported this in the past, and we continue to repeat it – bidding wars are back for highly desirable properties. Check in with your favorite real estate agent if you’re considering a sale to learn more about your specific situation.